Have you ever walked towards your beeyard, sight unseen, and heard the deep hum of a swarm in flight? I have. I’m still not at the point yet where I’m 100% comfortable with swarms. 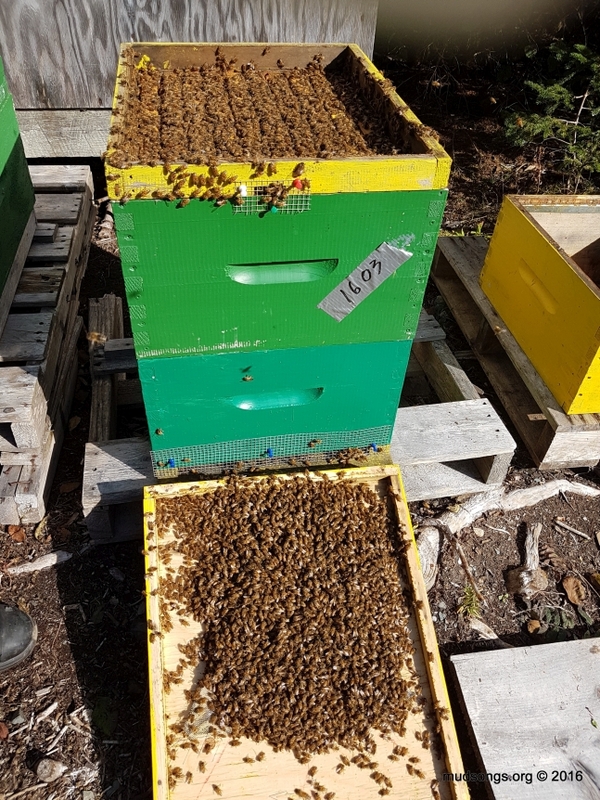 I will always say this because it’s true: The best beekeeping day of my life was the day I caught a swarm on a farm in the country where my bees couldn’t stress out any humans who would then pass on their stress to me. Humans ruin everything. The sound of a swarm in the distance should be exciting and fun for me (as it should for everyone), but it’s not. I’ve never fully recovered from the stress my neighbours caused me when they freaked out over one my colonies swarming past their back deck when I lived in the city. Although I live in a much more rural environment now, I have one particular neighbour whose kid’s swing set is not so far away from my beeyard. I single out the swing set because I imagine if my bees ever swarm, I know they’ll damn well land on that swing set — and I don’t know how my neighbour will react to that. Here’s a quick video clip I posted on Twitter that shows how I make use of my empty moisture quilts during the peak of summer. CORRECTION: In the video I said if it wasn’t so hot, I would put an inner cover above the moisture quilt. That’s wrong because it obviously wouldn’t do anything. The inner cover would go beneath the moisture quilt to reduce the amount of ventilation. Most of my moisture quilts are converted ventilator rims, deep rims with screen stapled to the bottom, some of them, such as the one in the video, with spacers screwed underneath. I know of commercial hive components that cost over $100 per hive that supposedly work ventilation magic on beehives. But for beekeepers on a budget (my kind of people), these $5 moisture quilts that I slap together with scrap wood and a piece of screen may be a better option. More examples of how I use my moisture quilts year-round can be found under my Moisture Quilts posts.